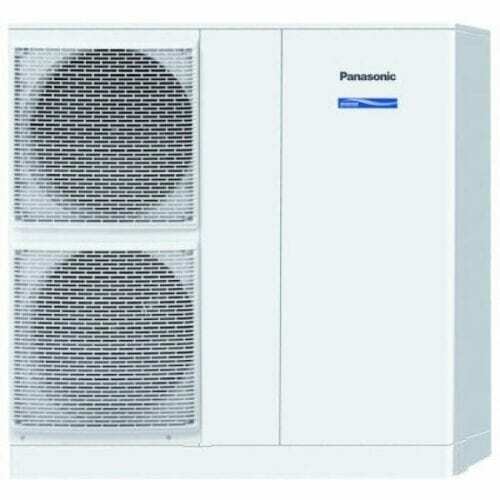 The Panasonic Aquarea Mono-Bloc 12kW Air Source Heat Pump is a High Performance Mono-Bloc Heat Pump. Whatever the weather, Aquarea can work even at -20°C. The Mono-bloc is easy to install in new and existing residential properties. Panasonic’s range of high performance Aquarea Mono Bloc Heat Pumps are the ideal solution for homeowners with limited space for an outdoor unit but high energy performance requirements. This innovative range has capabilities between 6kW, 9kW, 12kW and 16kW, meaning not only can a house of any size or challenge specify a suitable mono bloc system, but all products within this range are eligible for the Renewable Heat Incentive (RHI) across Europe. The innovative low-energy Aquarea Mono Bloc systems capture fresh air to cool or heat the property, ensuring maximum comfort. Suitable for new build and refurbishment projects, these units are capable of supplying water without additional backup heating sources. Aquarea is far cleaner, safer, cheaper and environmentally friendly than alternatives using gas, oil and other electrical systems. For more than 30 years Panasonic has been setting standards for the development of new, innovative and high performance photovoltaic products and is one of the leaders in the heating and air conditioning sectors. Panasonic photovoltaic modules are highly efficient and produce more power per square meter than traditional products and therefore you will need fewer modules on your roof to accomplish very high performance. Panasonic also manufactures an extensive range of air to air and air to water heat pumps that qualify for the new Renewable Heat Incentive (RHI) scheme, with a range of Mono bloc systems available with high performance guaranteed. Join our ZERO Home Bills Community. The Best Air Source Heat Pumps from the BEST Heat Pump Brands at the BEST Retail Prices available in your market on ZEROhomebills.com by Solaranna.